Located in beautiful North Cambridge, Reservoir Church is easily accessible by public transit or car from most Boston neighborhoods. 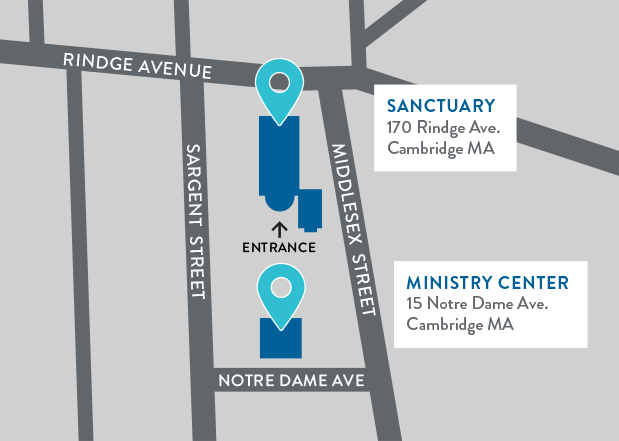 Our entrance, including parking lot access, is on Middlesex Street. The Davis Square Station on the Red Line is the closest subway stop, just a short 10 minute walk from the church. The #83 bus stops right in front of the church and gives you door-to-door service from Central Square or Porter Square. See the #83 bus schedule and map at MBTA.com. Driving Northwest on Mass Ave.
From the Harvard Square area, drive toward Porter Square. After Porter Square, turn left at the 3rd traffic light at Rindge Avenue. Drive 4 blocks to Middlesex Street. Turn left onto Middlesex Street. Driving Southeast on Mass Ave.
From Route 16 (Alewife Brook Parkway), drive 6 blocks and bear right onto Cedar Street. Cedar Street becomes Middlesex Street at the corner of Rindge Avenue. Cross Rindge and continue onto Middlesex Street. From Route 2, bear left after the Lanes & Games and Gateway Inn toward Route 16. Follow Route 16 to Mass Ave. (Rt 2A). Turn right on Mass Ave and drive 6 blocks and bear right onto Cedar Street. Cedar Street becomes Middlesex Street at the corner of Rindge Avenue. Cross Rindge and continue onto Middlesex Street. From the rotary near the Fresh Pond Mall, follow Route 2. Turn right at Rindge Avenue (immediately after Whole Foods and Staples parking lot). Drive 7 blocks to the corner of Rindge Avenue & Middlesex Street. Turn right onto Middlesex Street. Reservoir Church has a parking lot, located in the same area as the church building, between the main building and our administrative offices. Please help us welcome those who are new to our church by saving the church parking lot for first-time guests, drivers who are disabled or elderly, and families with young children. 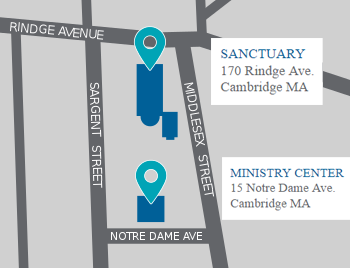 The City of Cambridge does not enforce parking permits on Sunday, so on-street parking is available all day in the neighborhood around the church. Please obey parking signage and be considerate of our neighbors by keeping driveways & corners clear. If you are visiting the church campus during the week, please park on the street in the neighborhood around the church if you have a Cambridge Resident Parking Permit. If you’re parking in the lot, please park in a yellow-lined space. The white lined spaces are reserved for the Benjamin Banneker Charter School that shares our campus. If the church parking lot is full, please proceed down Middlesex Avenue. There is more parking available at the park two blocks down on the left.